Many of us are hunters and hikers and like carrying a capable handgun for either hunting or personal defense. Support gear may make or break the experience. I have lost count of the times I have encountered a person with an inappropriate holster that was ruining their day. This occurs with personal defense holsters and also field holsters. The general run of pancake holsters used for personal defense keep the handgun close to the body to ensure concealment. This makes for an uncomfortable arrangement when you are in the woods, climbing, or hiking. The balance of speed, access and retention should tilt more toward retention in the field. The holster should keep the handgun out of the way until you need it. The rig must keep the pistol secure and the load carrying device must distribute weight as evenly as possible while offering a certain level of protection to both the user and the handgun. What goes into a good field holster? The first thing is a vial of sweat. When done correctly a field holster will last for a decade or so. Others will become a chafing nuisance and be discarded. Many times we spend time and money choosing the handgun and give little thought to the load bearing gear. The handgun is far more expensive, true, but the holster may make or break the hunt. We need a holster that keeps the gun secure and then which holds the pistol securely after we have taken the game. You should decide long before you purchase the holster what use it will be put do. As an example if the handgun is carried as a back up to the rifle, for use against coyote at close range or for personal defense, a shoulder holster or chest holster is a good option. A quality shoulder holster keeps the handgun out of the way of the rifle or shotgun. If you move seamlessly from town to the outdoors then a concealed carry handgun is desirable. If the handgun is the primary hunting firearm and access is important then a shoulder holster of the chest or exposed carry design is more appropriate. Most of us carry the handgun in some type of belt holster, but the shoulder holster gets the weight off of the hips and allows the hands more freedom of movement. A shoulder holster doesn’t snag when climbing as it holds the gun more closely to the body. Just the same some individuals have a more difficult time acclimating to a shoulder holster. Only a holster with plenty of adjustment will work. A good shoulder holster comes from K Bar J Leather Company. 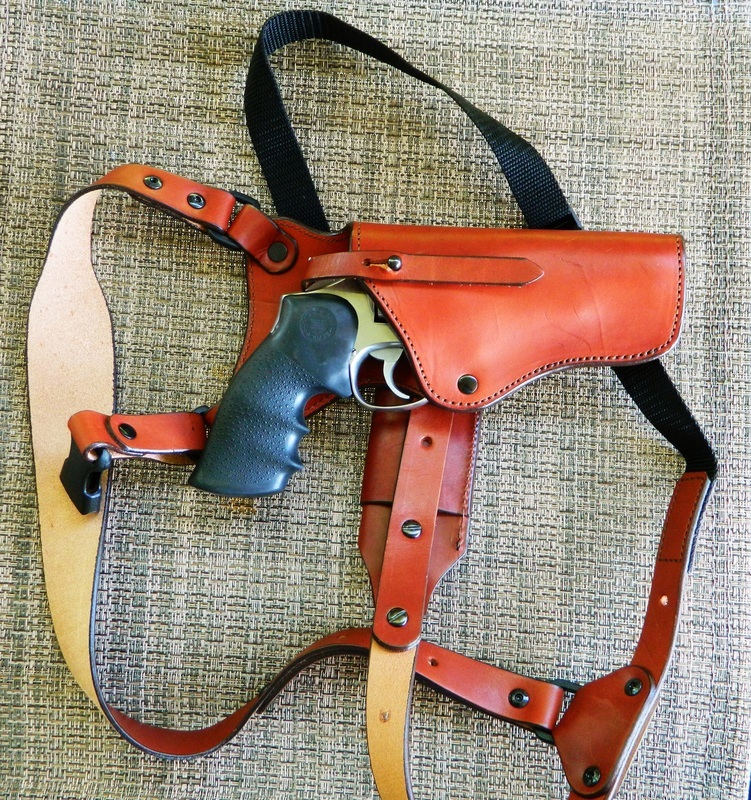 (kbarjleather.com) Jack Gully’s holster keeps the 1911 snug under the armpit and balances the weight of the handgun with two spare magazines on the off side. I normally deploy the Commander with a magazine full of Black Hills 230 grain JHP. This load is up to anything I have met so far. The spare magazines are sometimes loaded with the same load, sometimes the Black Hills 230 grain FMJ load. This is an outfit I like a lot. The range of adjustment is excellent and the holster is quite comfortable. Jack also offers a chest holster with many good points. When the Army designed the Tankers’ holster back in the 1930s’ they hit the mark as far as access and comfort. The Tanker holster was designed to avoid banging into things on the inside of a Sherman tank. Jack’s modern design is a far better holster with much more adjustment. I often deploy my .357 revolver in this holster. The holster is particularly good when heavy outer garments are worn. Handy with a natural draw, the chest holster has much to recommend. 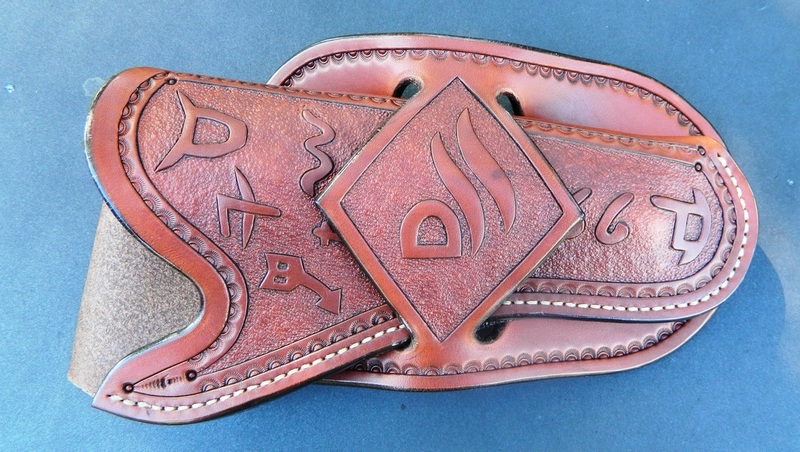 When I am hunting with a handgun I sometimes use the Mexican loop western style holster. While a high ride is desirable for concealed carry use the low riding cowboy holster makes for greater ease of access when hunting. These are practical holsters for all around use and I simply like them a lot. 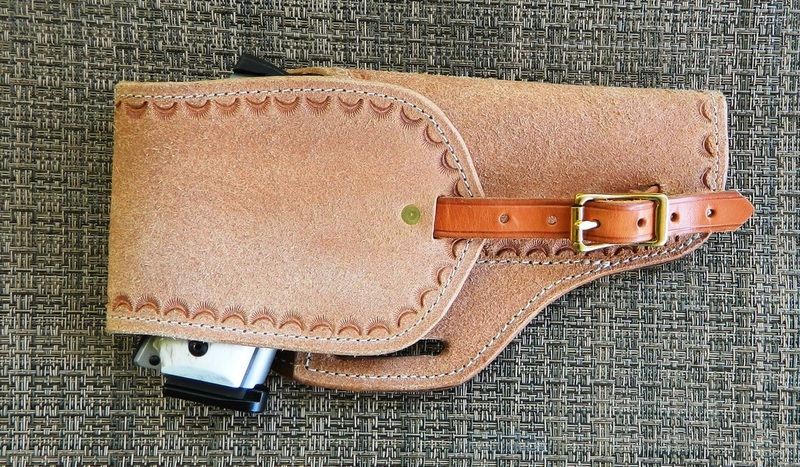 The Mexican loop design illustrated, the Diamond Loop Cattlebrand Holster from Frank Kaiser’s Rocking K Saddlery LLC (rockingksaddlery.com) is as good as it gets in a field holster for packing the Ruger Single Six .22 Magnum. You guessed it, this is my squirrel and bunny gun and it works just great. Of course it would be a good cowboy action holster. But for me the Mexican Loop/Western holster is a great field holster. I have examined quite a few original saddle leather holsters and I believe that the modern holsters from Rocking K are better than most and as well made as any. When looking for a good field holster the men that carried a handgun in the outdoors all day- cowboys – knew a lot about the proper design. When you wish to protect the finish of the handgun and speed isn’t an issue a flap holster is a great option. The Horsewright Clothing and Tack flap holster illustrated gets the business done with more than just utility, but with a great deal of style as well. I like the rough out finish and the retention strap is ideal. This holster is probably the most practical field holster illustrated, affordable, and long lived in field use. This one fits a variety of handguns but the flap keeps each snug despite the varied frame sizes. (horsewrightclothing.com) This holster is a no nonsense design that I like a great deal.